Adam Perry Lang is getting back to his summertime roots with a new barbecue menu at his Hollywood restaurant APL. The plan is to start serving everything from brisket to burnt end sandwiches starting tomorrow. Perry Lang’s new daytime barbecue menu will run from 11:30 a.m. to 3 p.m., Tuesday through Saturday. Diners will be able to order inside the restaurant, instead of at the attached Hole in the Wall takeout window, which means there will be options for beers — either on tap or in cans. As for the menu itself, Lang will serve Texas-style low and slow brisket available for $7 per quarter pound, pork ribs for $16 a half-rack, plus sandwiches like pulled pork and burnt ends from the APL beef short ribs when available. Those massive bone-on short ribs Perry Lang made during his backlot barbecue days will also be available on Saturdays only for $32 a pound. These will all run concurrently alongside the existing daytime menu of chili dogs and that gigantic $50 serious sandwich. Perry Lang says he’ll be there slicing this week, just in time for warmer spring days. Starting this Tuesday April 16th I’ll be cooking BBQ overnight for Lunch 11:30 to 3pm (Tues thru Sat)@aplrestaurant brisket, ribs, sides, beers on tap, cans, eat in. Come say hi, be the first, I’ll be slicing. 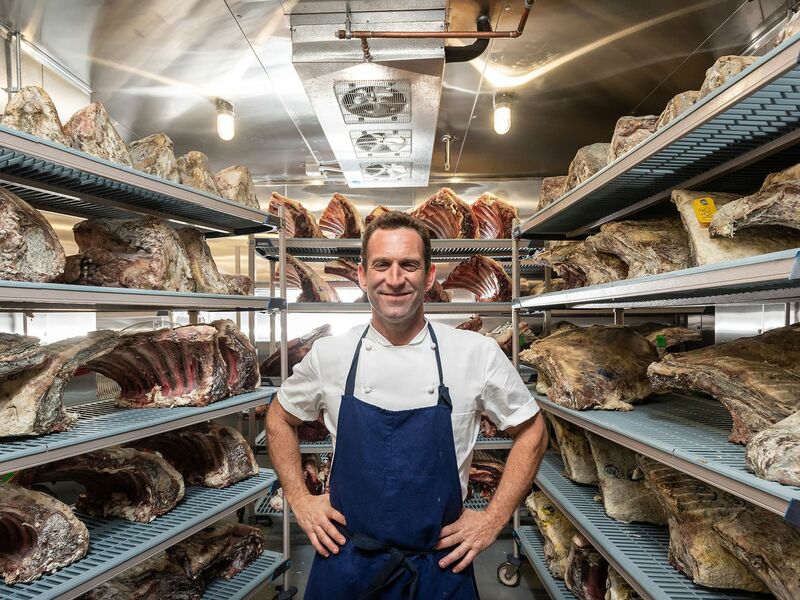 The barbecue hall of fame chef hasn’t done a dedicated barbecue menu for quite some time in Los Angeles, at least since opening his equally meaty dry-aged steakhouse and brasserie on Vine in Hollywood. His addition to the growing landscape of LA barbecue should immediately take the whole scene up a notch, alongside places like Ugly Drum and Moo’s Craft BBQ at Smorgasburg, Ragtop Fern’s, and Slab on West Third. APL’s barbecue starts tomorrow and runs Tuesday through Saturday, 11:30 a.m. to 3 p.m.
BBQ at APL. 1680 Vine St., Hollywood. CA.